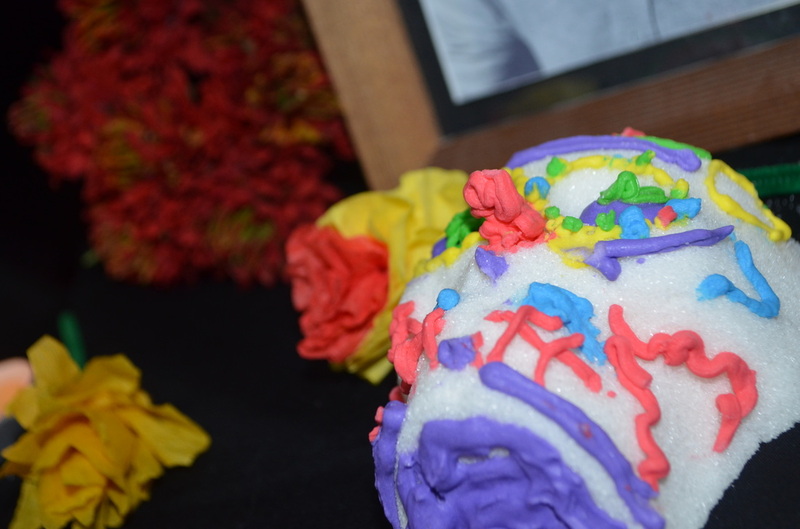 ​Dia de los Muertos is a cerebration of the dead and celebrating their life. It is celebrated in mexico and it is celebrated on the 1 to the 2 of November. 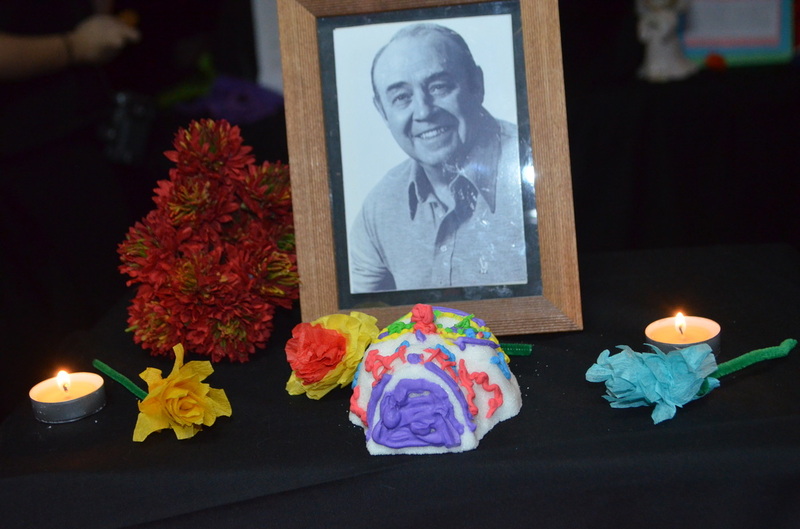 This kind of celebration is like a huge party and people who celebrate it usually bring goods and foods that are most often sugar skulls, ponderousness, and others. For display they usually use a alter that is decorated with belongings that the dead liked such as beer, flowers, things that their person had or liked, cigarettes, and more! They would use lights or candles to light up their display that shows flowers that are called marigolds. A traditional altar does not have to be so difficult. All you would have to need are a elevated surface, maybe a milk crate to put over top of it to have another level, a black sheet to put over those items, lights and candles to guide the dead, marigolds, some of their belongings or things they liked, and a little bit fun. From this being my first Dia de los Muertos, I think this was a great experience for me and it went very well. I was very touched of my altar at the end where the whole Spanish class put theirs together and same was my mom. I had a great time doing this again and I would definitely want to do it again. Corey Papenhagen era un muy bien feliz persona. Ẽl era un alto, trabajador, y inteligente persona. Ễl le gustaba nadar, trabajar, y también viajar. Ẽl a veces le gustaba hacer atrevido cosas. Y todavía ẽl está en nuestra corazón. Ẽl le gustaba ir de caza mucho. Era un buen padre cuando mi abuelo era un niño. Ẽl nació el 12/25/22 y se murió el 5/24/91. Mi padre says él era muy serio y feliz. Mi padre además says yo guapo mucho me gusta el. Ẽl era mi padre abuelos. Ẽl tenido mi abuelo y ello vivir en Caseville Michigan y Bonita Beach Florida. Ẽl era un bien persona y we corazón él. We all have read that Nicaragua is a very poor place with children who can't read because there aren't any books around to read for them self's sadly. We have this whole year been reading, speaking, spelling, and learning Spanish and it was time to put our hard work and make something that is cooler in my opinion that we have done this whole year. We were instructed to make books with our skills and to publish them then to send to Nicaragua for the kids there who need education. We were not allowed to be in groups for this but me and a friend, Robbie wanted to make something such as a mini series about a pig and a Donkey. We didn't know how that popped in our heads but the idea sounded cool to have a donkey and a pig going on adventures and of course, those two animals are just "lit". Long story short of both books, the first book, there are two animals and they go on an adventure and get in trouble leaving them grounded and not able to hang. Second story is when they try to "escape" and hang out. I myself hope these children like this book as any other book out there and hope they get out of this book is to not steal. Just don't take things that don't belong to you. I hope that they will like these two great story's and learn something from them both.